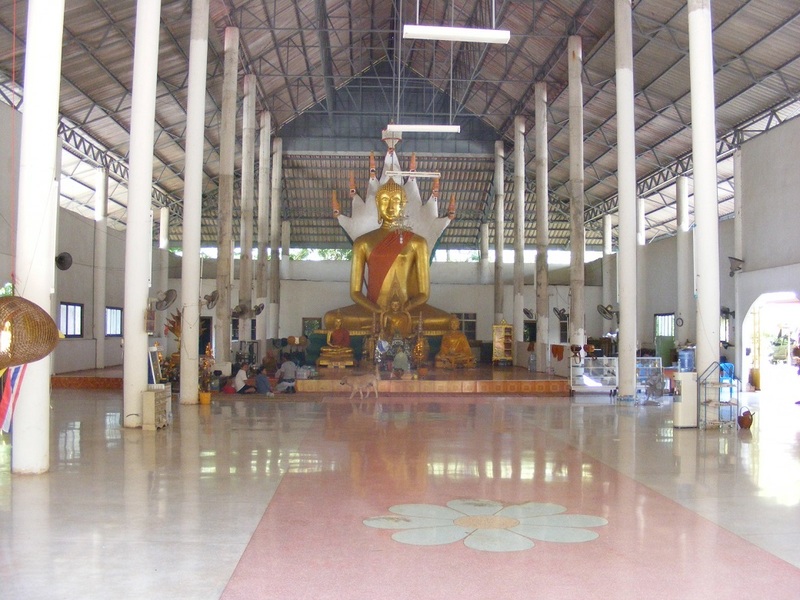 Wat Nong Dan is one of those temples in the Udon Thani area that is not often seen by visitors as it sits on a road in the middle of nowhere and a road that does not lead to anywhere of special interest to most people who do not live in the immediate area. Wat Nong Ban is about 7km north east of the small town of Sam Phroa to the east of Udon Thani. The road is a typical country road, twisting and turning through rice farms, grassland and the odd small residential area. 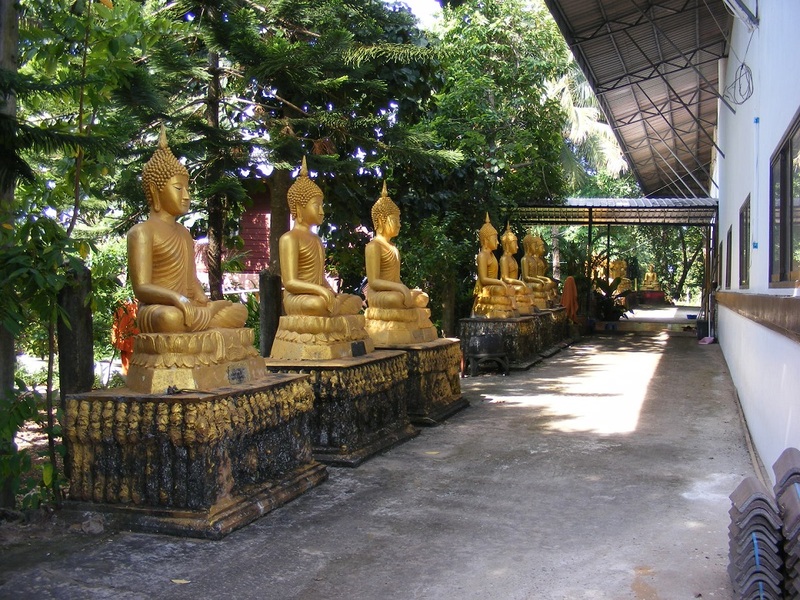 It seems that you are heading nowhere as you drive along but you will know when you are approaching the temple grounds as you pass a large, white sitting Buddha in a small compound on the left. The entrance features two imposing temple guardians, which you can also see at the City Pillar Shrine in Udon Thani and as you just pass through the gate you may begin to wonder if there is actually anything to see but keep going, it's worth it. When you park near the main temple building you will begin to see a good number of Thai Buddhist symbols and statues scattered around. 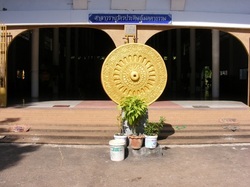 The first symbol is the large golden gong that is placed centrally at the entrance to the main building and on either side of this are three buddha statues and more gongs. 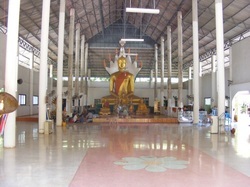 Inside the main building is a large Buddha statue surrounded by the Naga Snake which is very common in this region. 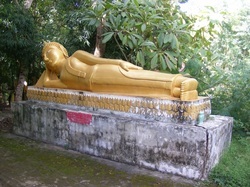 There is also a much smaller Buddha, again with a Naga Snake surround where the locals and visitors pray and talk to the spirits. When we visited we met the "head" monk who must be one of the oldest monks I have ever seen, quite easily in his late 60's or early 70's. 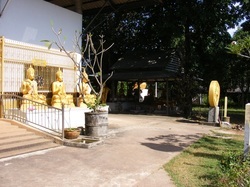 The normal access to the building is round the left hand side where you pass a series of more small sitting Buddha statues. If you head to the rear of the building you will see yet more sitting Buddha statues and further on a reclining Buddha that is perhaps on 6m long, quite small compared to many in Thailand. Beyond the statues, hidden behind the trees is a small lake that is packed with several species of fish. There is a small bridge leading to a hut that you can stand on to feed and see the fish, and with some good luck, some of the big ones that live here. Pellets to feed the fish with can be bought from the main temple building for 10 baht a bag. 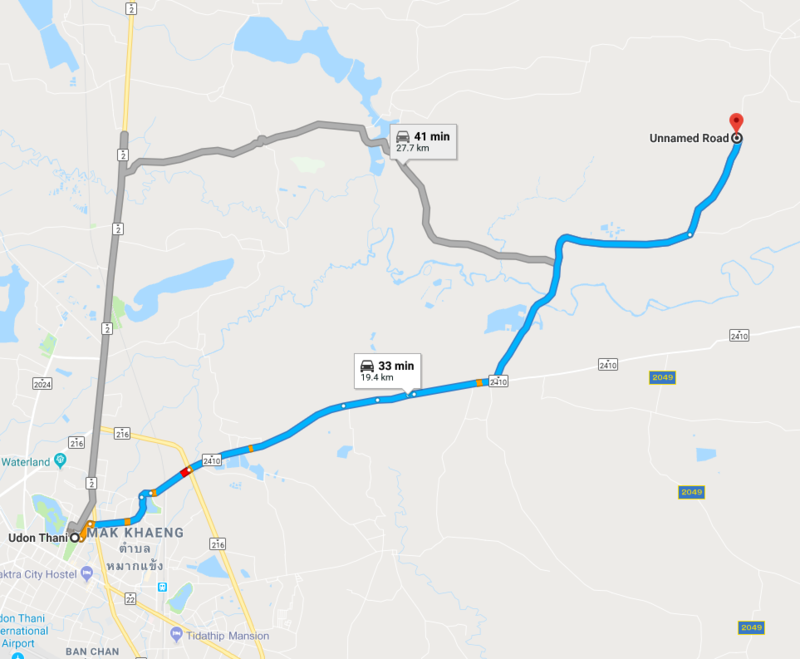 From Udon Thani, head east on route 2410 and go to Sam Phroa. Once in the town you turn left at the crossroads with traffic lights (the only one in town). 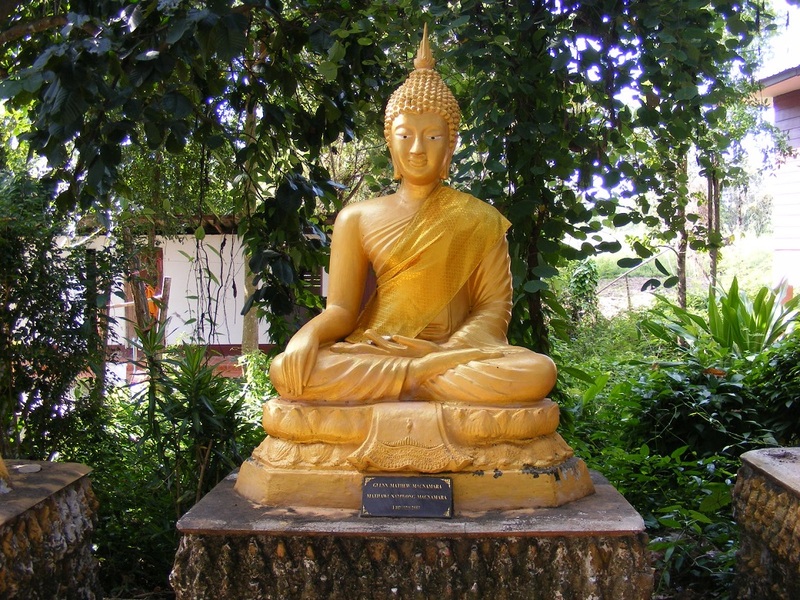 It is then simply a case of following this road all the way to Wat Nong Dan.